Timeless words of wisdom that apply as well today as they did in 1905. 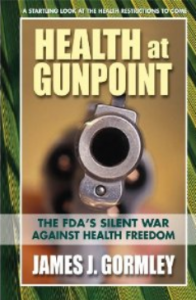 These are the central questions explored in Health at Gunpoint: The FDA’s Silent War Against Health Freedom, what I hope you will consider to be a groundbreaking book that brings into clear focus the silent war now being waged by the FDA against all of us: American consumers. In Health at Gunpoint, I present a history of both the natural foods movement and of this over-reaching Federal agency and examine how the agency has changed over the years. I then look at the FDA’s most controversial decisions and the troubling reasons behind them. Why did the FDA try to shut down the supplements industry by getting most supplements classified as drugs? Why did the FDA drag its feet on folic acid fortification while thousands of babies were born with devastating birth defects? Why did the FDA try to get life stages (such as pregancy and aging) and normal discomforts (such as headaches) classified as diseases? Why are irradiated and genetically-altered food not labeled as such? Why does the FDA favor synthetic additives and dangerous drugs over natural ingredients and dietary supplements? Why did the FDA propose a guidance that would cripple the health food industry as we know it today? Health at Gunpoint will help prepare you for the coming fight. I haven’t seen much regard of late for the rights of citizens. Hi, and thanks so much for visiting my site. So, how did I get here—and how did you get to this here? Well, I can take a stab at the first question, at least! From 1984 through 1989, I worked in hospitals and medical center public affairs. From 1989 through 1994, I was an allied health/medical book editor (for companies like Appleton & Lange and Plenum) — where I had a chance to shepherd and develop a couple of really cool books (including Cultural Diversity in Health and Illness) — and a managing editor for The American Journal of Medicine and The American Journal of Surgery. Although I did some fun stuff along the way—such as doing horror book reviews for Publishers Weekly , helping to organize the Bram Stoker Awards and developing a Writer’s Digest book for the Horror Writer’s Association called Writing Horror — it wasn’t until 1995 that I became a full-time journalist. That was when I had the chance to serve as editor-in-chief of Better Nutrition magazine until 2002. Since then, I have worked as a regulatory and scientific affairs officer for Nutrition 21, editorial director for VRM Inc., and editor for SanovaWorks. So whether you are here from my health blogs or my horror blogs, I hope my website will answer your questions or at least provide an easy way to contact me. I invite you to enjoy the site, the blog, the links and the shop!